Marshon Lattimore, Tre’Davious White and Desmond King are names that often draw high praise when referring to the cornerback class in the 2017 NFL Draft, and for good reason, of course. Lattimore was the NFL’s DROY a year ago; King is the highest-graded cornerback in the NFL since entering the league; White has allowed just 73 yards in his last eight games. But a name lost in the accolades of the aforementioned cornerbacks is a pretty good one in Marlon Humphrey. Among all of the 2017 draft class’ cornerbacks, only King, the NFL’s highest-graded cornerback through Week 13 at 90.2, ranks ahead of Baltimore Ravens‘ Humphrey in overall grade so far this season. 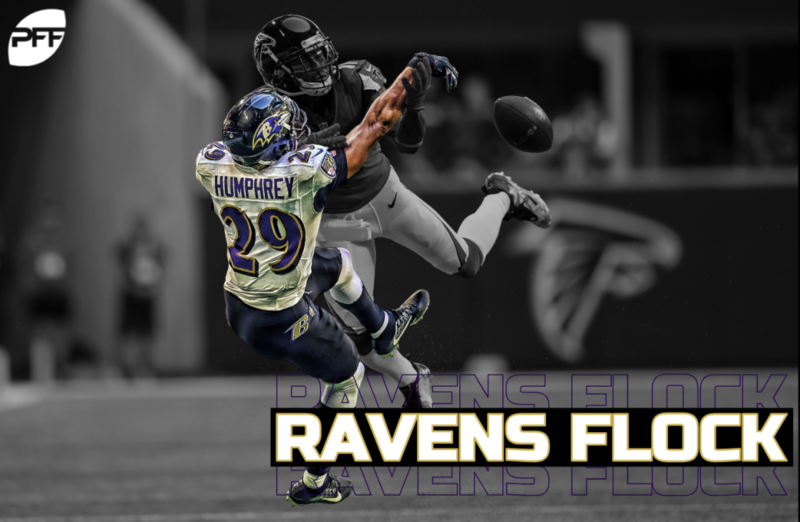 Humphrey ranks 10th in overall grade (79.9) and coverage grade (81.4) on the year, and his two-year overall grade (81.2) ranks 16th among all NFL cornerbacks with 1,000-plus defensive snaps dating back to Week 1 of the 2017 season. After earning an impressive 73.9 overall grade as a rookie a year ago, Humphrey has taken his game to the next level and then some in Year 2. The former ‘Bama standout currently leads all qualifying defensive backs in forced incompletion percentage (40.9) on passes of 10-plus air yards, as he’s allowed receptions on just six of 22 such targets for only 100 yards all year long. Removing dropped passes and off-target throws, Humphrey also leads the same group of cornerbacks in yards allowed per target of 10-plus air yards at 5.88. Limiting the big play starts with limiting deeper throws, and Humphrey has done just that. He’s also limited third- and fourth-down conversions at an absurd rate, as he also leads the 67 defensive backs with 15-plus targets into their coverage on third or fourth down in forced incompletion percentage (40.0) and ranks third in percentage of targets resulting in a first-down conversion (20.0). Stripping away the qualifiers, Humphrey’s forced incompletion percentage (25.4) and yards allowed per coverage snap (0.75) in all situations rank third and eighth, respectively, among cornerbacks with 200-plus coverage snaps on the year. Expanding the sample size to include all of last season, Humphrey ranks third in forced incompletion percentage (25.0), fifth in passer rating allowed (68.3) and 16th in yards allowed per coverage snap (0.92). Humphrey may still be chasing the names of his colleagues (i.e., Lattimore, White, King), but he’s within arm’s reach jumping ahead of them and earning elite status in the league.